This fabulous Watermelon Salad is full of Feta Cheese, Fresh Basil and Shallots, which sounds slightly crazy – but it’s amazingly fresh and delicious! The summer sweetness of the watermelon is highlighted by the savory ingredients, fresh herbs a touch of lime juice. Yum. Combine sliced shallots & lime juice in a small bowl for a few minutes. 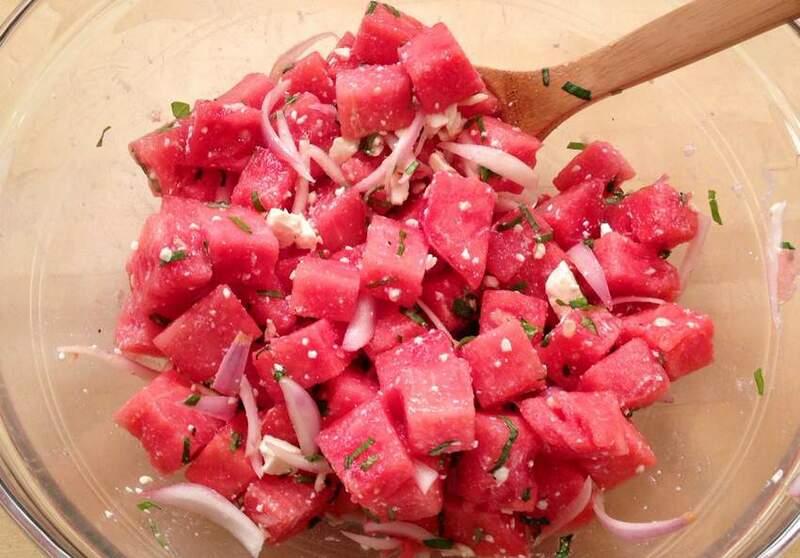 Then, in a large bowl, toss the watermelon, basil, Feta & shallot mixture, and sprinkle lightly with salt & pepper. Serve & enjoy! This entry was posted in Main Dishes, Recipes, Salads & Dressings, Side Dishes and tagged celiac health, g-free diet, G-Free Foodie, gluten free cooking, gluten free food, side dish, summer. Bookmark the permalink.